Start your trip in the heart of the world-renowned Orchard Road precinct filled with shopping, entertainment and cultural attractions. Grand Hyatt Singapore makes for a colorful vacation with lush gardens, concept cuisine and 677 charming accommodations with scenic views. Your path to inner “damai” (peace) is paved with spa treatments, techniques and traditions of Chinese, Malay, Indian, and European cultures. Continue your wellness workouts at the 24-hour fitness center with Technogym®. Resort-like relaxation is yours at the pool surrounded by a secluded garden, lounge chairs and private cabanas. Elevate your stay, perched on the 20th floor, where the Grand Club Lounge offers continental breakfast, all-day refreshments and evening cocktails as an upgrade. Indoor-outdoor, residence-style event spaces complement this destination also known as the “garden city”. 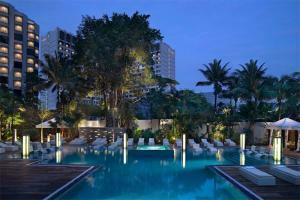 Located in the Orchard Road precinct, approximately 19 miles from Singapore's Changi Airport. Mass transit is nearby.